Leggendo questo blog sono venuto a conoscenza di questo interessante problema; Se voglio realizzare un buon singleton , magari utilizzabile in ambiente distribuito, avrÃ² bisogno che metodi esposti siano syncronized, anche quelli statici. I’m also getting interested in GWT and I can’t wait to see it grow with time. I really like that the js produced that gets to the client is custom made for the UI that you create and you can avoid sending huge js files which is an issue with most plain old js libraries. It seems that Intel will be implementing the new Penryn 45 nm CPUs using a HighK material + Metal Gate manufacturing process. While this has been in the air for some time (I’ve reported on this back in 2005 and I believe I’ve heard it even before), it seems that they have resolved issues that would make these materials suitable for mass production and be reliable enough as market devices. The material that will replace the silicon dioxide is called hafnium and the article speculates it could increase the K factor from 3.9 to something between 15 and 40. 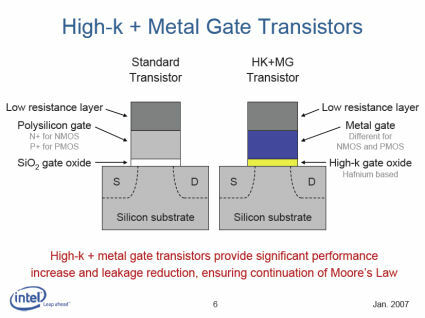 This is important as processors get fabricated at smaller and smaller dimensions the distance between the silicon substrate and the gate diminishes as well and up to now this was the primary leakage that was holding out processor evolution. With Penryn coming up in the second half of this year, it’ll give Intel a significant boost, allowing for more energy savings, an expanded instruction set with SSE4 and perhaps a clock increase as well. What are AMD and IBM cooking in their foundries and labs is also interesting but it seems Intel has beaten them to the clock but they are a close behind. This is great for the consumer as Intel knows it has to capitalize on this research as soon as possible in order to get the money invested in it as soon as possible and before other manufacturers get to do the same. Even if this is not a revolution in what a transistor is or how it executes its logic, it gives a breath of fresh air and additional period of exploitation as the classical performance race drives the industry. I think I’ll wait for this Penryn beast, in the mean time check out the new SSE4 instruction set. Disegnare su una lavagna condivisa : ImaginationCubed . Creare testi e tabelle direttamente da google doc. Inserire i link di del.icio.us sul proprio blog con Sociable. Cosa altro dire buona lettura. Molte delle persone che passano in questo blog (foll e sergio) sanno benissimo quanto sia difficile progettare una buona interfaccia web/grafica. Tempo addietro mi ero giÃ imbattuto su un tool scritto in java che aiuta nella creazione di un sito sia a livello di interazione tra le pagine, sia a livello grafico. che dire strumenti per veri gtd. Per quel che riguarda lo studio consiglio una presa visione , la struttura a griglia chiarifica molto bene un problema complesso come quello della segreteria telefonica, sicuramente si puÃ² tranquillamente adottare ad altre problematiche. Dalla progettazione in generale passiamo alle GUI, ho trovato un’altro tool utile invece per sviluppare Gui in Java, invece di scrivere righe di codice a volte intricato ora basta scrivere del’xml (XAML copy??). …scusate ora devo andare a salvare il mondo …. Tra ieri e oggi nei momenti di relax dallo studio ho gironzolato per la rete e ho trovato alcuni siti interessanti, che ho piacere segnalare. Come scegliere un buon font per scrivere. Google Reader custom search with Greasemonkey. Qualche bel wallpaper per il 2007. Yes, I found the notice from Punto Informatico : Microsoft being come to an agreement with Zend for realy support PHP 5 and 6 in IIS. 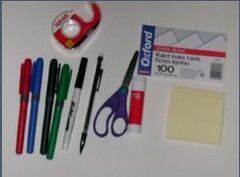 You are currently browsing the SigmaLab blog archives for January, 2007.